Almada ([aɫˈmaðɐ]) is a city and a municipality in Portugal, located on the southern margin of the Tagus River, on the opposite side of the river from Lisbon. 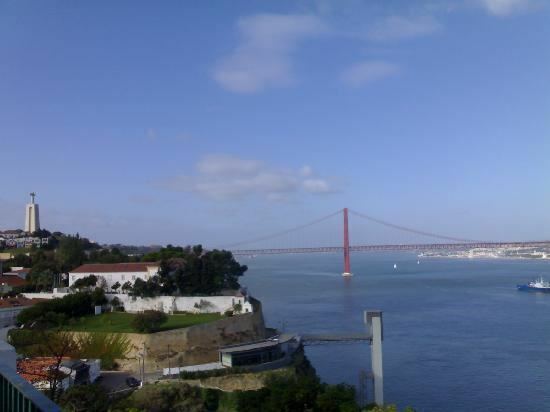 The two cities are connected by the 25 de Abril Bridge. The population in 2011 was 174,030, in an area of 70.21 km². The urbanized center had a population of 101,500 in 2001. Although small in area, Almada has a high population density. It is bounded to the southeast by Seixal, to the south by Sesimbra, to the west by the Atlantic Ocean and to the north and northeast by the Tagus River. At Cacilhas, its main port, ferry boats transport visitors and local residents across to Lisbon daily, while the 25 de Abril Bridge, which spans the Tagus, is traversed by rail, commercial and personal vehicles daily. Almada is considered a transportation hub and a fast-growing suburb; its coast has several sandy beaches and panoramic vistas.